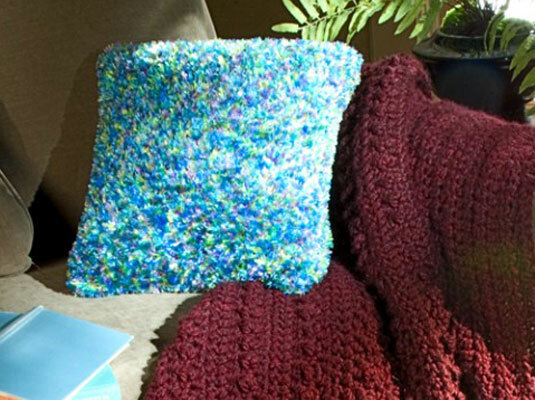 This crocheted boa pillow is fluffy and cuddly. To crochet this pillow, you use boa yarn — a very short, thick eyelash yarn with a strong base thread. With this project, you get to practice sewing pieces together, and at the same time create a pillow that rivals many that you see in stores — and at a fraction of the price. Pillow form: 16 in. x 16 in. Gauge: 10 sc = 4 1/4 in. ; 10 rows = 4 in. Row 1 (right side): Sc in 2nd ch from hook, sc in each ch across (42 sc), turn. Row 2: Ch 1, sc in each sc across (42 sc), turn. Rep Row 2 until piece measures 16 in. from beg. Fasten off. Repeat Step 1 to create the other side of the pillow. Thread your yarn needle with a length of yarn approximately 24 in. long. With the right sides of the front and back facing each other, sew the pieces together using the whipstitch around three sides. Match stitches across each edge. Insert pillow form between 2 pieces.